Have a small bedroom? Want to be sure you’re getting the most out of every inch? We like to think that small spaces are filled with outsized opportunities. Here are five ways to make the most of yours. Start by putting your bed in the center of the most visible wall. (It’s usually the wall facing the doorway.) You’ll have enough space to jump under the covers from both sides. Add in two nightstands if you can. Designer hint: Framing the bed or not, lighter walls make rooms seem more spacious. Big furniture can put the squeeze on small rooms. If you have space, tuck your chest or dresser in the closet. You’ll free up valuable floor space, make your room appear larger, and have your clothes in one convenient spot. Is your rug an afterthought? Shouldn’t be. It can help make a small room look bigger, add softness, and introduce colors or patterns that tie your design together. Follow your bed’s lead to understand what size rug you need. If the bed is centered, slip the rug about 2/3 of the way under. If it’s in a corner, put the rug next to it or under another piece of furniture. Learn more about choosing the right-sized rug. When it comes to small spaces, storage is key. Be creative. 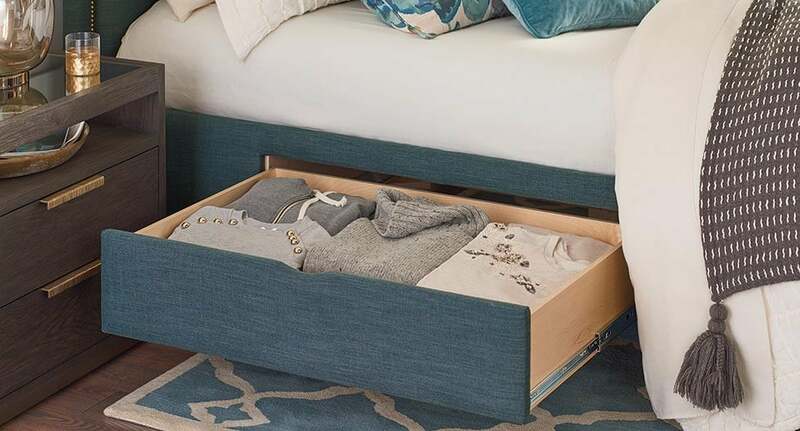 Use under-bed storage to stash out-of-season clothing and custom shelving to store things like shoes and books, for example. You can even put a storage ottoman at the foot of the bed and get extra seating to boot. 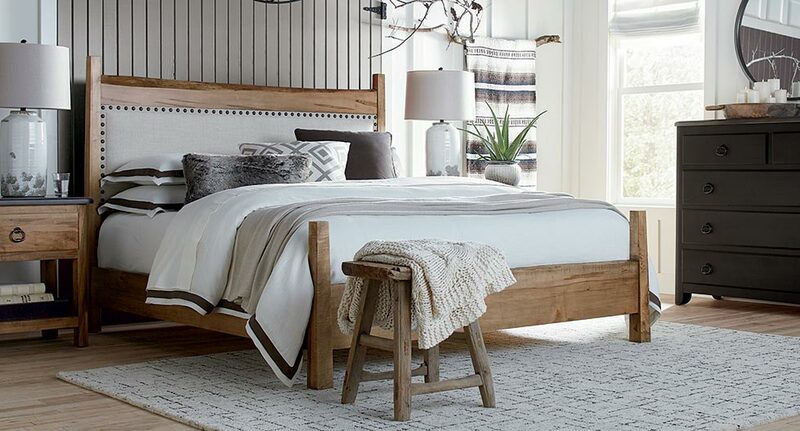 Designer tip: Storage beds are another great way to get extra space without giving up on style. Now that you know the basics, grab a pencil and a piece of paper and sketch your ideas. Even easier, use our online room planner to arrange your space without breaking a sweat. You’ll find it here. Play around until you’re convinced that 1) it’ll work or 2) you need to go shopping. 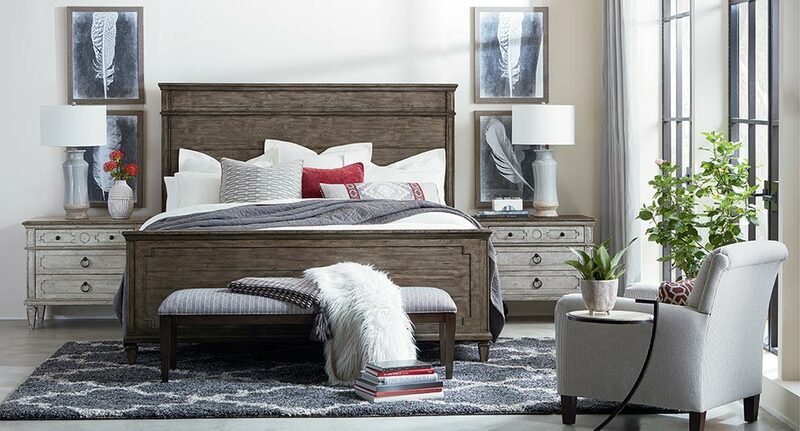 Need a smaller bed, different dresser, or to start over? Instead of stretching to fill a massive space, tiny rooms let you to focus on a few perfect pieces and special touches. With a little imagination — or the helping hand of a Bassett interior designer — your room will feel more like a boutique hotel room than a shoebox. And every square inch will be filled with personality. Yours!